A bit of a ramble, sorry. So just thanks and on to more lovely photos. This Tom Sheerer room... a bit more ornate than I typically go for, but I'm totally smitten with the mix of modern and earthy and glam. Pretty much a perfect combo in my opinion. Our soon-to-be table... I haven't blogged about this yet, but we (and by we, I actually mean Bryan) are starting work on our dining room table... Yes, this means Millie's bed is on hold for a smidge, but we'll get there + I'm still agonizing over that darn wallpaper, so there's plenty to do. 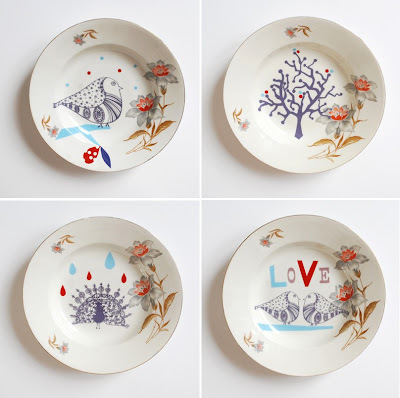 Nina’s totally gorgeous hand painted plates … I’m loving her work. 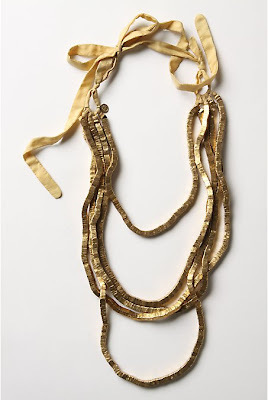 This necklace from Anthro... Bryan if you need anniversary ideas, this might just be the ticket. 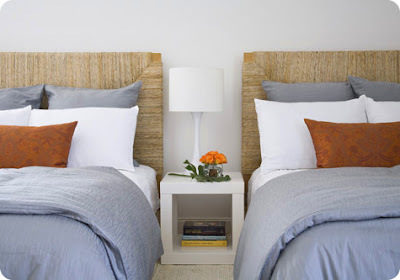 This color palette (room by cy design via d*s), which makes me want to switch out my white duvet cover, and that's HUGE, as I've had a white duvet cover for hmm...well, a decade. Um, wow. 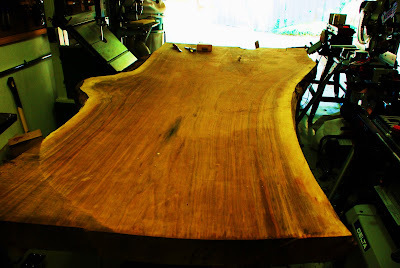 I so love your dining room table in progress. So beautiful. I can imagine many happy meals there. P.S. Hope your blues blow out of town soon. The anthro necklace is stunning. Definitely a good anniversary gift idea. And your dining room table is beautiful. I can't wait to see what you do with the whole room. 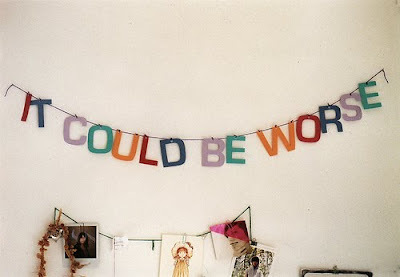 I also think banners that say things you don't expect them to are so much fun. love that tom scheerer room!! What a great reminder in that banner! 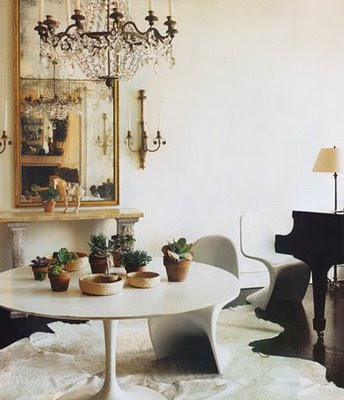 What a beautiful dining table! I hope you share pics when it is finished! You're inspiring me to start one of my many projects on my "to do" list. Like you, I've been stuck on what to do in my daughter's room. I've been frozen and indecisive on what direction to go with her room for about 8 months now! Ha! That table is going to be the bomb! Can he make one for me when he is done?!? So very cool. Hope things start to look up. We all have our off days... As I just said to my friend Carolyn, "we need to have grace and patience for ourselve, grace and patience." Thanks for linking to me!...And I totally understand the need to step back and lower expectations for a little while...Right now, all I want to do is play with my daughter's dollhouse with her! I just need to back away from the goals, and savor what's important. Hope you find your way; I'm certain you will...! The table is going to be stunning. There is an architect here in San Francisco who has beautiful hand-carved eucalyptus tree table in their conference room - it always makes my heart beat a little faster when I see it! I love that Anthro necklace - a stunner! So glad you are feeling cheerier today! When I taught middle school, I always told my kids that nothing would cure their "woe-is-me" like doing something kind for someone less fortunate - and less fortunate comes in lots of appearance, wardrobes, and income brackets! It always works for me! I bit of doing nothing is always a good idea so is getting that necklace. i think i need that banner. right above my desk. right now. glad you're feeling better--wishing you a peaceful week. Great banner, haha. And those plates are adorable!! Oh my - your table is going to be gorgeous. Exactly what I've been fantasizing about for a table. Can't wait to see the finished result! that table is going to be a work of art! it already looks amazing as-is! ha! that banner made me laugh, and i love the rest of the pics. i'm feeling you on the blues - a lil pick me up is most definitely in order! Can't wait to see what B does with that dining table. Wow - it's going to be gorgeous! I am glad that your table is now in progress. I find it big and sturdy and also beautiful.